A group of astronauts, engineers and scientists ventured deep into the ocean for NASA’s Extreme Environment Mission Operations 21(NEEMO). A band of "aquanauts" are living more than 60 feet below the surface of the ocean near the Florida Keys in the name of space exploration. 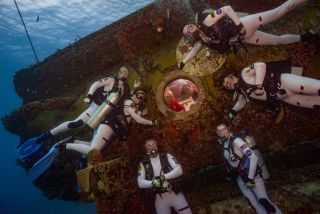 The international crew — including members of NASA and the European Space Agency (ESA) — is participating in a 16-day underwater expedition designed to simulate the extreme environments astronauts may face in future deep-space missions like the journey to Mars. "Aquanauts" undergo deep-sea training and research exercises, in order to teach space agencies about working in space. "NEEMO 21 astronauts and crew will pioneer complex tasks on the seafloor utilizing the most advanced underwater navigation and science tools, which are methodically choreographed to mimic a Mars exploration traverse," Bill Todd, leader of the NEEMO Project, said in a statement from NASA. "Equipment can fail, communication can be challenging and tasks can take longer than expected. Other tasks go just as planned. All cases are equally beneficial," Todd said. "It’s how we learn and how we are able to assemble all of this together so that someday we're prepared for the unexpected when we are living on and traversing the Martian surface." NEEMO 21 crew and support team. The 16-hour decompression period alone — which the aquanauts undergo in order to safely return to the surface — is "longer than it would take to return to Earth if you were on the International Space Station," Matthias Maurer, a member of the NEEMO crew from ESA (ESA), said in a statement from the agency. Aquarius — NASA's undersea habitat — is located 62 feet below the surface of the Atlantic Ocean in the Florida Keys National Marine Sanctuary. Here, the NEEMO crew will test new software and technologies, as well as perform simulated "spacewalks" to collect biological and geological samples, NASA officials said in the statement. So far, the expedition appears to going swimmingly. The NEEMO crew has tested optical communications equipment, explored local reef systems, and even sequenced DNA for the first time under the sea, according to a tweet from Reid Wiseman, who is the NASA astronaut leading the first half of the 16-day NEEMO mission. In 2014, Wiseman flew in space as part of Expedition 40/41 and spent 166 days living and working aboard the ISS. NASA astronaut Megan McArthur, who has served as a Mission Control spacecraft communicator for both space shuttle and space station missions, will command the second half of the expedition, NASA officials said in the statement. You can follow the rest of the #NEEMO21 mission on Twitter.